Situation: Several of the rooms have the old style ceiling mount metal BX boxes with a metal support bar that spans between the joist. Does anyone know if they have any type of accepted weight rating? I.e. Are they acceptable for paddle fans. I know they will hold one, but are they acceptable to use in retrofit work? I'm just trying to avoid putting a hole in the ceiling to change it out to a ceiling box that is "officially" rated. Boxes at Ceiling-Suspended (Paddle) Fan Outlets. Outlet boxes or outlet box systems used as the sole support of a ceiling-suspended (paddle) fan shall be listed, shall be marked by their manufacturer as suitable for this purpose, and shall not support ceiling-suspended (paddle) fans that weigh more than 32 kg (70 lb). For outlet boxes or outlet box systems designed to support ceiling-suspended (paddle) fans that weigh more than 16 kg (35 lb), the required marking shall include the maximum weight to be supported. 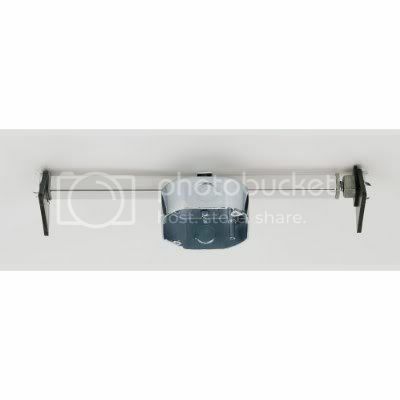 Ceiling-suspended (paddle) fans shall be supported independently of an outlet box or by listed outlet box or outlet box systems identified for the use and installed in accordance with 314.27(D). What if the metal support bracket that spans between the joists is drilled and tapped with 10-32 srews and the fan is supported by that? Would that not qualify as being independently supported from the box? What if the metal support bracket that spans between the joists is drilled and tapped with 10-32 screws and a fan rated box is attached to the support bar with these 10-32 screws with the fan attached to the fan rated box? They have a retrofit model cailing fan box, it actually works nicely. The biggest problem I've had doing this type of work is with the Bx's being too short to make up the new box.I've found the best way to do this is with a hacksaw blade holder, which will fit into the opening of the ceiling, strip the bx long enough to fit into the box. apply heat shrink tubing over each conductor is what I personally like to do.99% of the time the fan housing will cover any plaster which happens to break free during the work. As far as the code that would be a judgment call. I would not trust those metal supports because all is mounted with is probably couple of drywall nails. Im not so sure that would have any less strength than using one of these. I've replaced the original bar with these and the original bar seemed to have been more secure. Grab a hold of the bar and lift yourself off the ladder. It it holds you're ok. If not, well you've got some drywall to patch. You've hit on yet another area where I think the NEC needs a bit of editing. I don't think the committee ever intended to say 'you can only use a box that is specifically made and marketed for fans.' After all, we have decades of safe fan installations that predate the code requirement. Indeed, it seemed almost ridiculously obvious: an inadequately supported fan would promptly fall, and the guy who hung it would get to fix the mess and try over. As you learned the trade, you learned how to make sure you didn't get THAT call-back. Then a few firms came out with clever boxes that let you retrofit a fan-strong box in places where you didn't have access to the back side. Someone (naturally) asked for listing, or some assurance that the gadgets would perform as advertised. Another eagle-eye noticed that the traditional 'pancake' box was a bit shy on wire space; so fancy boxes were invented. The next thing you know, we have code language that requires you to use one of these purpose-made boxes. I'm sorry, but a nice 4-square box, screwed to a solid piece of lumber that you have attached to the ceiling framing, is plenty strong for supporting a fan. I suspect the box / bracket you describe is also plenty strong. You just lack the testing and listing that the current code requires. As much as I like complying with codes, I'm not sure if I have ever used a 'listed fan box.' I doubt I ever will. Except for a few special circumstances, I just don't see the need. Then again, I never imagined that someone would try to hang a fan without using any box - let alone a flimsy plastic 'old work' type. It seems that as soon as things are made 'idiot proof,' they come out with a better idiot.